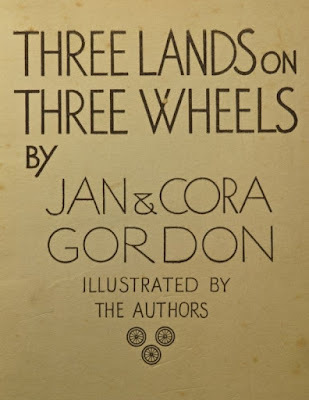 Jan and Cora Gordon dedicated "Three Lands on Three Wheels" (1932) to Steven and Gertrude Spurrier, "a poor recognition of their rich friendship." 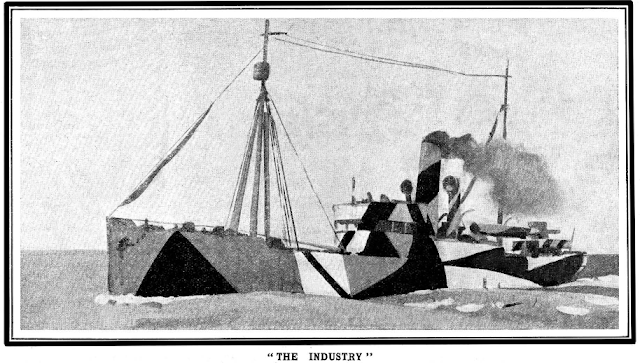 This friendship dated back to WW1 when Gordon and Spurrier had worked together on dazzle painting designs for wartime shipping. There is a wonderful earlier dedication from Jan Gordon to Steven Spurrier in a copy of "Modern French Painters": "To my old pal Spurrier in memory of the purest art we ever touched. Dazzle. Jan Gordon." The idea that the Gordons should tour France, England and Ireland in succession and record their contrasting impressions came from their publishers (Harrap & co) and they duly set off, spending two months in France, one month in England and six weeks in Ireland. The book, however, contains 13 chapters on France, but only 3 on England and 4 on Ireland. The book received a very mixed review from "Pierre and Pierette Pan" in "The Tablet", which concluded with "It is time, however, for this couple of authors to grow up." There is, however, a far more positive review in The Waterford Standard of May 22nd 1937. "Jan and Cora Gordon, in their delightful travel-book .. describe "The Tour of the Wandering Wardrobe" in France, England and Ireland. 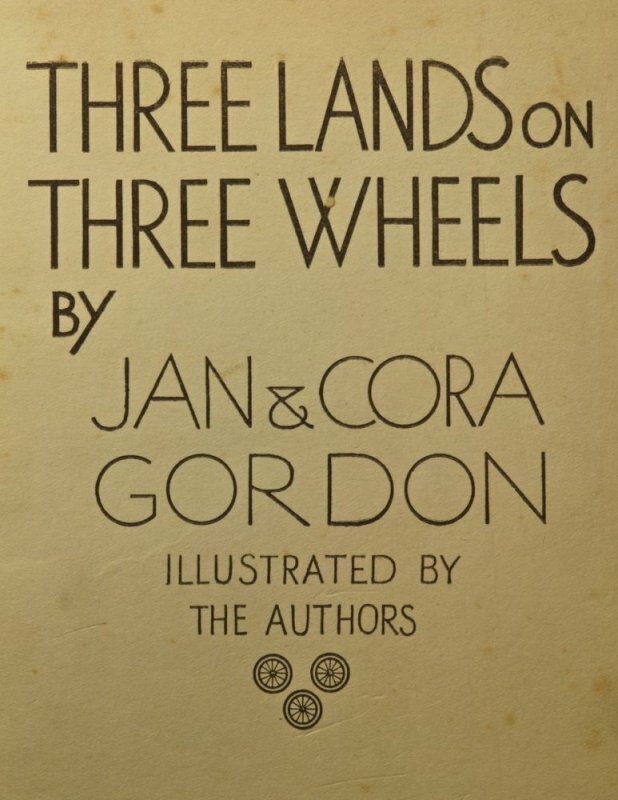 Perhaps I can best give you the idea of how Jan and Cora (by the way, he calls his wife Jo throughout the book) planned the journey .. by quoting the authors' description of the second-hand motor-cycle and side car - hence the three wheels - on which they got about. 'Our purchase was not viewed with enthusiasm in the green-bowered alley of studios where we lived in Paris. General opinion seemed to be that we had joined a suicide club. Our death warrants were sealed. The neighbouring sculptor's pretty little daughter stared earnestly into Jo's face with her sloe-black eyes and sighed: "And you were such nice people." True they didn't know that Jo would not be riding alongside in the "wife-killer." That was only for luggage. She was to take her place on the pillion seat in what I claimed to be the ideal situation for a married woman: "Behind but slightly above her husband." Our side-car was only a makeshift. It was a piece of ironwork that had rusted for many years among the debris of the agent's store, and he added it for the modest sum of an extra pound. 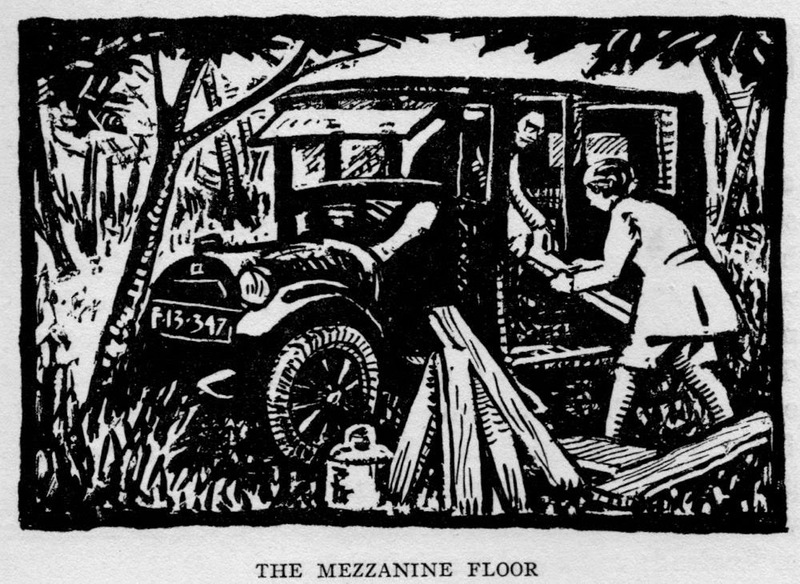 It was only a skeleton and on its empty springs we placed a long box, some five feet by two and a half feet square, which, painted a natty green, gave us what we hoped was an air as respectable as that of any baker's boy with his moto delivery-van. The sculptor, father of the child who had uttered our epitaph, cast an eye on our apparatus and exclaimed: "Mais, voyons, c'est une véritable armoire ambulante!" Translated into English it became thus: "The Wandering Wardrobe." The author of this review, "D.C.B." goes on to write that, "About England, France and Ireland they have in this book given us fresh and individual impressions, and I will conclude by giving you a significant quotation in which Ireland is summed up from the tourist's point of view in very few words: 'In Germany almost everybody is beginning to take his holiday on the roads; afoot, with motor-bike, or in a car. In France cheap touring has been brought to a high pitch of economical perfection. In Ireland a certain easy wit and fluency enlivens the dreariness and monotony of the food and accommodation to be found.'"